A favorite part of a recording day of Sewing With Nancy is the Nancy’s Corner interview segment. Often, I interview individuals that represent charitable organizations. They share how skills learned or projects created by sewing and quilting benefit so many. Thousands of Sewing With Nancy viewers have taken the initiative to donate time, supplies, and/or projects after watching the interviews—thank you so much! You can watch a variety of the interviews by clicking here. Click here to view a list of all previous Nancy’s Corner guests. We’ve been checking back with some of the initial Nancy’s Corner interviews. My assistant Lois contacted Wisconsin Nicaragua Partners of the Americas—to see how sewing is making a difference in the lives of the women in Nicaragua. Partner programs cross a broad spectrum of society and the day-to-day lives of people throughout the Americas. For example, Wisconsin partners with Nicaragua, North Carolina teams up with Bolivia, and Indiana is paired with Brazil. To find a group near you, follow Partners of the America’s blog page and hover over Chapters. Wisconsin is unique in that their partnership has a sewing emphasis. When I interviewed Lynda Pracht in ’11, she explained that volunteers teach sewing and other skills to the women of Nicaragua. At approximately 100 centers, women work on treadle sewing machines and donated electric machines to create beautiful free-motion embroidered doll clothes. The sale of these doll clothes, Chica Nica Doll Dresses, make the difference between poverty and a sustainable lifestyle for the artisans. The workmanship is remarkable! The sewing skills learned by the women of Nicaragua have taken on new importance. Many are now sewing burn therapy dressings. According to Amy Wiza, Executive Director,“It is a sad but much-needed service not currently available in the country. It’s really touching lives in a meaningful way.” Sewing makes a significant difference in people’s lives. Community connection, an uncanny coincidence! This part of the blog will not be as meaningful to most of you as it is to me. Yet, put it under the category of unbelievable coincidence! Shortly after sending the follow-up email to Amy Wiza, Executive Director, Lois, my assistant, received this reply. I’ve seen this ambulance in and around our relatively small community (16,000 people) for many years. It makes me smile to know it lives on in Nicaragua. Sewing and quilting are skills that make a difference, a significant difference! Where do you get the fabric for these projects? Hiya very nice site!! Man .. Excellent .. Superb .. I will bookmark your site and take the feeds additionally…I am glad to seek out a lot of useful information here in the publish, we’d like develop extra techniques in this regard, thanks for sharing. Thank you Nancy! Today, July 21 would have been Lynda’s Birthday, in remembrance of this humble and remarkable woman, we posted some of her photos and a link to your blog on the Wisconsin/Nicaragua Partners Facebook page. For Lynda, being a guest on your show was a great honor and a wonderful way to share with others the impact we can have when we look out for the needs of others. Lynda was so proud of her interview with you! Thank you for that wonderful gift to her, and for featuring her once again on your blog. Thank you for telling us about this organization and their work. I am always looking for ways to use sewing in a charitable way and this is just wonderful. I hope you spotlight more efforts like this when you find them. Thank you! Thank you Nancy for posting this information telling us how our old Beaver Dam ambulance is blessing Nicaragua. I appreciate and applaud your desire to promote charities. You are living out the Lord’s directive to love others as ourselves. Thank you. Thank you, Nancy, for being such a bright light in our world and telling us all about these wonderful organizations. I do charitable sewing in Canada and have made 100′s of the pillowcases dresses for Africa through the yahoo group outfitsfororphans and oodles of bibs, receiving blankets, diaper bags, and babies clothing for caringforcanadians. 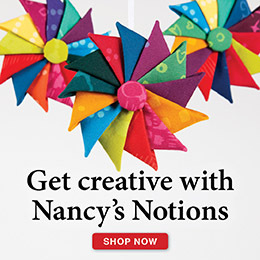 I am so inspired by Nancy’s Corner! Oh my goodness, I am so impressed with these women’s sewing skills…I do not have the patience to control the stitching like that of the cutwork. I am grateful to have my Ellisimo! As an RN, I am thrilled to see the Beaver Dam ambulance live out it’s remaining years in such a worthwhile, and much needed, way. Thank you, Nancy, for all you do to promote these ventures.